In the early 1960s, Belfast nightlife largely consisted of a number of licensed cabaret clubs with genteel pianists and singers and an array of sedate ballrooms where smart-suited showbands pounded out cover versions of the latest top ten hits. 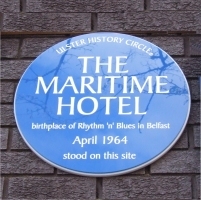 But in April1964, in the aftermath of the popular music earthquake triggered by the Beatles and the Rolling Stones, a spartan seamens’ hostel in College Square North, Belfast, which had formerly been a Royal Irish Constabulary police station, was transformed into the Club Rado and a new rhythm ‘n’ blues movement in the city was inaugurated. A group called Them, sporting long, long hair and unkempt casual clothing, was in the vanguard of this new musical phenomenon and within weeks of its opening, long queues of fashionably dressed teenagers formed outside to ensure they got into the 200 capacity hall to enjoy the throbbing music. 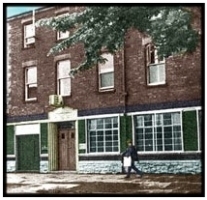 In no time, the Maritime, as it was more widely called, had earned a reputation on a par with the famous Cavern Club in Liverpool, where the Mersey sound was incubated, for highlighting a new generation of exotic musicians who were inspired by the traditional American rhythm ‘n’ blues tunes but who gave the music their own twist laying the foundations for what would years later evolve as Celtic rock. Other of the Maritime alumni are still active musically playing the blues around various venues in Belfast. Among the regular Maritime favourites during its brief heyday from 1964 until it became a casualty of the civil disorder some five years later were Rory Gallagher and the Taste, Just Five (featuringSam Mahood), the Lovin’ Kind, the Mad Lads. the Alleykatz, the Interns, the Aztecs, the Deltones, Five by Five, the Method, the Few and the Fugitives. 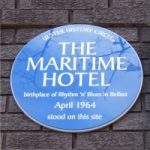 But unquestionably the Maritime is still celebrated and renowned for nurturing the world class talents of Van Morrison, the lead singer with Them. There his early iconic songs such as Gloria and Mystic Eyes were given their first airings, often at improvised length with their punchy style whipping the dancing crowd to a buzzing frenzy. It was during one of these performances that the Decca Records scout decided to sign the band up paving the way for Them to score several top ten hits, including Baby Please Don’t Go and Here comes the Night, before Morrison departed to launch his own outstanding international career as a best-selling album artist and concert performer. Among rhe earliest songs in Morrison’s now vast repertoire are two directly linked to the formative days at the Maritime. 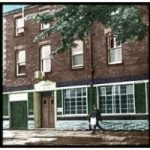 Joe Harper, Saturday morning, refers to the Maritime caretaker who frequently let the band use the hall for rehearsals when they could not get a room above Dougie Knights record and bicycle shop in Great Victoria Street where many bands of all musical persuasions practiced.